Captain of Indian Karate Team, Seven times National Champion (Seiko Kai), Nine Time Delhi State Champion, 3 times MIC – Youth Games Gold Medalist, Commonwealth Championship Medalist and has won many championships of International levels. 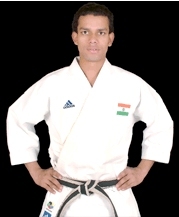 A qualified referee and judge of National & Asia (Seiko Kai) as well as General Secretary of Sports Karate Do Organization India, Technical Secretary of Shito Ryu Seiko Kai Karate Do India and Official Member of Karate Do Association of Delhi. He is also Team Coach and Team Manager of – Indian National Karate Team (junior), for WORLD CHAMPIONSHIP and COMMONWEALTH CHAMPIONSHIP and Organizing Asst. Secretary of South Asian Senior Karate Championship. For the last 15 years won championship of National and State, levels, also participated in International Events and Seminar by world grandmasters. An officially authorized and technically qualified Martial arts instructor in Asia, trying to promote martial art among the people of India, especially the younger generation, so far he has trained more than 5,000 (No of Female Student 1500 within One year – age 18 year to 25year) people and still practicing under the guidance and supervision of his Respected teachers. Represented Indian National Karate Team for International Championship through – Karate Do Association of Delhi, All India Karate Do Federation and Indian Olympic Association Recognized By: Govt. of India & Indian Olympic Association (Ministry of Sports & Youth Affairs). Note: If you have any talent ( Academic, Sports, Dance, Music, Painting etc. ), please send photo, work with brief profile for publishing at Talent section at Dwarka Parichay.